On signing The Manufacturing Enhancement Act of 2010, the US President Obama said: “[Manufacturers] often have to import certain materials from countries and pay tariffs on those materials. This legislation will reduce or eliminate some of those tariffs, which will significantly lower costs for American companies across the manufacturing landscape...” (Obama 2010). In contrast, Donald Trump, currently the Republican party nominee in the 2016 election for president of the United States, has argued instead for erecting trade barriers against what he called “unfair” Chinese imports. Trump argues this (and other protectionist measures) will “make America wealthy again” (Trump 2016). Economists mostly demur, as trade protection unequivocally hurts consumers by raising prices. This concern becomes more important when we take into account the rise in global value chains (Baldwin 2012) which can exacerbate the rise in prices if protection is applied to key inputs. Input trade liberalisation has benefits. Amiti and Konings (2007), for example, show a 10 percentage point fall in input tariffs results in a 12% gain in productivity for Indonesian firms that import these goods. Goldberg et al. (2009) find that the Indian trade liberalisation in 1991 enabled domestic firms to import new varieties to produce new products. Research on upstream trade policy is mostly focused on liberalisation, not on protection. Following the rationale of the input liberalization literature, increasing import duties on key intermediates is clearly detrimental to the domestic manufacturing firms that use these inputs. One way for the downstream firms to pass on these losses to final consumers is to gain import protection for their own products. This type of protection was fittingly coined ‘cascading protection’ by Hoekman and Leidy (1992). In our recent research (Erbahar and Zi 2016), we examine whether protection granted to intermediate manufacturers leads to petition for protection by their downstream users. We were motivated by the use of temporary trade barriers (TTBs) in the US, which include anti-dumping (AD), countervailing duties (CVD), and safeguards (SG), on vertically-linked products. Bown (2014) shows that these measures, which are much more frequently used than tariff hikes, covered about 3% of US imports in 2013, making it the most prolific TTB user after India in terms of import coverage. Notes: Years in parentheses are the imposition and initiation years for inputs and outputs respectively. Inputs and outputs are matched according to the information provided by the US International Trade Commission publications. The list is not exhaustive. Source: Temporary Trade Barriers database (Bown 2014). Table 1 shows a few examples of potential cascading protection. For example, in 1998, several US manufacturers of hot-rolled steel applied for AD protection, and the Department of Commerce imposed measures in 1999 on these products coming from Japan and Russia. In 2001, the US initiated a massive safeguard investigation covering 611 10-digit Harmonized Tariff Schedule (HTS) products that are heavy downstream users of hot-rolled steel. Measures were imposed on a large majority of these products in 2002. In another example, in 2001, the US applied AD duties on polyethylene terephthalate (PET) imported from India and Taiwan, after a petition by Dupont Teijin Films, Tsubishi Polyester Film, and Toray Plastics Incorporated. In 2003, five US producers of polyethylene retail carrier bags, a user of PET, requested AD duties for their products, with measures imposed in 2004. A look at the sector-level input-output (IO) relationships, as depicted in Figure 1, reveals that TTBs are often concentrated in sectors that are closer to each other in terms of IO relationships (the heavy TTB targets are in red, and the light TTB targets in blue). 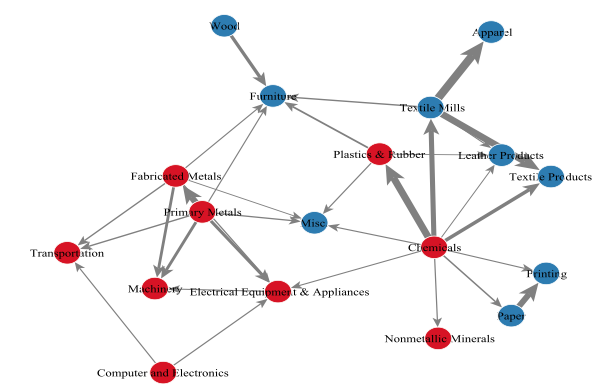 Note the cluster of heavily targeted sectors on the left side of the figure, indicating that primary metals and the industries that use them tend to petition the most for TTBs. The consequences of the recently initiated AD investigations on steel, rubber, and certain chemicals in 2016 might be quite troubling for the user industries in the years to come. Notes: Nodes indicate NAICS3 sectors and links indicate input to output relationships. The links thicken as cost shares increase (with minimum cost share set at 10% for visual clarity). The colours indicate TTB target concentration (red is heavy, blue is light). A sector is a 'heavy' target if it is in the top 10 targeted sectors between 1988-2013. Source: Calculations based on the Temporary Trade Barriers database (Bown 2014). Domestic demand for the output industry is large. We test our main prediction by first identifying the IO relationships among the time-varying TTBs of the US using its detailed IO tables provided by the US Bureau of Economic Analysis. Our identification relies on the fact that US TTB proceedings do not give legal voice to downstream firms during an investigation on one of their inputs. This means that upstream protection acts as an exogenous shock to the downstream firm. Our empirical results show that measures on imported inputs increase the likelihood of their downstream users' subsequent trade remedy petition by 3 percentage points on average in 1997-2013 (the effect for the entire 1988-2013 period was one percentage point, indicating that cascading protection is largely due to TTBs imposed after the WTO was founded in 1995). This represents about 23% of the mean initiation rate (13%) in that period. The effect depends not only on the importance of the input in terms of its cost share but also on upstream and downstream industry characteristics as described above. For example, protecting the iron and steel industry affects a multitude of user industries, and back-of-the-envelope calculations show that the steel wire drawing industry would be the most heavily affected with the probability of petition increasing by about 10 percentage points. Protecting plastics, on the other hand, affects the plastics plumbing fixtures industry with increasing its probability to petition by about 6 percentage points. Consumers bear the cost of this protection: as input price increases are passed on to final good prices, consumers are pushed to purchase more expensive domestic goods. Our quantitative exercise shows that consumer welfare losses in the US are economically significant when cascading protection exists. When we shut down all input protection as a counterfactual exercise, we see that the consumer welfare losses are almost halved. Our paper has a clear policy recommendation: trade policy investigations should take vertical linkages into account.1 The EU and a few other countries have already implemented a ‘community interest test’ into their AD proceedings in order to consider the potential downstream effects of AD measures. However, the US and the large majority of active AD users have yet to add in this crucial piece of legislation that would give downstream users a legal standing. As shown in our paper, this would limit protection on key inputs, eventually benefiting the consumers. Amiti, M. and Konings, J. (2007) “Trade Liberalization, Intermediate Inputs, and Productivity: Evidence from Indonesia,” American Economic Review 97(5):1611-1638. Baldwin, R. (2012) “WTO 2.0: Global Governance of Supply-Chain Trade,” CEPR Policy Insight 64. Bown, C. P. (2014) Temporary Trade Barriers Database, The World Bank. Erbahar, A. and Zi, Y. (2016) “Cascading Trade Protection: Evidence from the US,” Tinbergen Discussion Paper 16-079/VI. Goldberg, P., Khandelwal, A., Pavcnik, N., and Topalova, P. (2009) “Trade Liberalization and New Imported Inputs,” American Economic Review 99(2):494-500. Hoekman, B. M. and Leidy, M. P. (1992) “Cascading Contingent Protection,” European Economic Review 36(4):883-892. Ikenson, D. J. (2011) “Economic Self-flagellation: How US Antidumping Policy Subverts the National Export Initiative,” Cato Institute Trade Policy Analysis 46. Obama, B. H. (2010) Remarks by the President at the Signing of the Manufacturing Enhancement Act of 2010. Ossa, R. (2011) “A “New Trade” Theory of GATT/WTO Negotiations,” Journal of Political Economy 119(1):122-152. Ossa, R. (2014) “Trade Wars and Trade Talks with Data,” American Economic Review 104(12): 4104-4146. Trump, D. (2016) Full Transcript: Donald Trump’s Jobs Plan Speech. Daniel Ikenson (2011) argues that the US AD law should be reformed substantially due to the costs imposed on downstream industries.